Azusa Murakami and Alexander Groves of London-based Studio Swine researched their latest design project by traveling to the heart of the billion-dollar global human hair market in the Shandong province of China, the world’s largest exporters of human hair. The result of that research is Hair Highway, a "contemporary take on the ancient Silk Road," in which they explore the possibilities of using the renewable resource that is human hair to create a series of objects that at first glance betray nothing of their source material. Groves wrote in an email that the project started when they were looking for alternatives to using tortoiseshell for a collection of eyewear frames. "Hair is one natural resource that is actually increasing globally," he said. "We knew that China imported the most amount of tropical hardwood from slow-growth forests across Africa, and we wanted to explore the possibility of using Chinese traditional crafts with a sustainable material." The designer pointed out that hair is a strong material; a single strand can withstand 100 grams of weight. "The average person has around 120,000 strands of hair, so theoretically a person's hair could take 12 tons—that's two elephants!" Groves said. He added that Asian hair grows thicker and faster than any other hair type: On average European hair grows 10 mm per month, while the average in Asia is 13 mm per month. The gross product per head each year is approximately 10 miles, he said. Using human hair as a design material has a long history. The Victorians were famously fond of hairwork, in which they would weave commemorative, mourning, or otherwise sentimental jewelry from human hair, and they customarily filled lockets with a lock of a loved one’s hair. Groves pointed out that in the 13th century, in what is now the southwest United States, Anasazi women wove socks out of their own hair. Most recently, Groves said, human hair can be used for the amino acid L-cysteine, which can be added to baked goods. 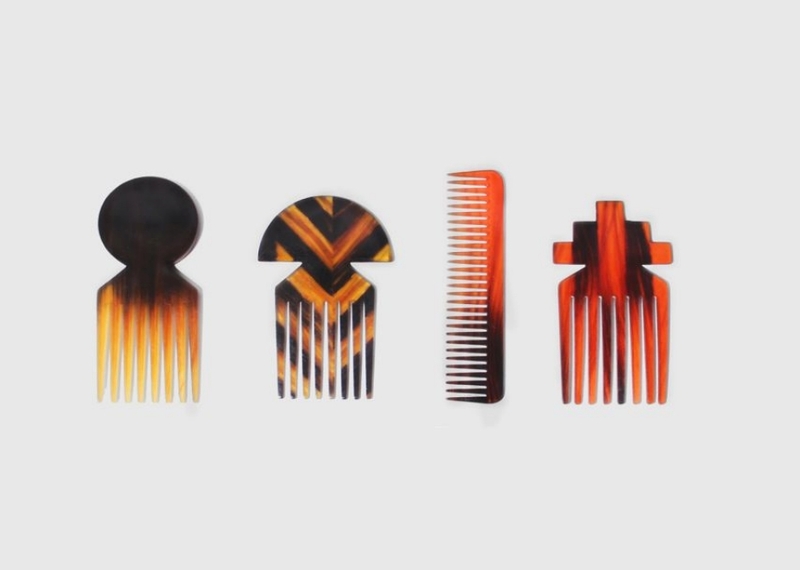 The Hair Highway project includes slyly self-referential hair combs as well as jewelry boxes and a patterned mirror frame base. To make the objects, the designers poured natural pine resin over factory-processed tresses of washed, combed, straightened, and trimmed human hair that might otherwise have been destined for a second life as wigs, toupées, or hair extensions. After the mixture set in silicone molds, they worked with local carpenters who cut and fashioned it into a series of objects that have a polished, high-end look inspired by 1930s Shanghai-deco style. "The wood craftsmen spent their lunch breaks gathered around us studying the material, but they also very quickly adapted to working with it," Groves said. "In the hair factories hair is very much a dehumanized material to them, but they were really impressed and surprised with the resin composite material." The designers say that their composite material "provides a sustainable alternative to the planet’s diminishing natural resources, with an aesthetic that evokes the palettes of tortoiseshell and a grain resembling that of polished horn or exotic hardwoods." But as beautiful as the composite material is, there is a creepy undertone to using human body parts in design. The use of human hair stirs the chilling historical memory of Nazis who were said to stuff pillows with human hair forcibly shaved from the heads of prisoners during the Holocaust, a horrifying twist on the practice of using horse hair to stuff the world’s most expensive mattresses or pad the seats of luxury cars from Mercedes-Benz. Groves said a major reason he and Murakami traveled along the Hair Highway was to see and meet the people who sold them their hair. "It's their choice to sell their hair, and as the global demand increases, the amount they can get for it increases. We are used to people selling their time, skills, goods—why not their hair?" Kristin Hohenadel's writing on design has appeared in publications including the New York Times, Fast Company, Vogue, Elle Decor, Lonny, and Apartment Therapy.